Bill Durst is a Canadian Blues- Rock- Roots guitarist, singer, songwriter, entertainer who has written and recorded over 125 songs on 12 albums with 7 national radio chart hits. He has opened for, or shared the stage with Rush, Areosmith, BTO, Yardbirds, John Mayall, Savoy Brown, Bobby Rush, Little Feat, George Thorogood, Bad Company, Loverboy, Edgar Winter Group, Jeff Healey, Burton Cummings, Johnny Winter, Rick Derringer, Jack de Keyser, April Wine, L.A. Guns, David Wilcox, Bob Seger, Sly And The Family Stone and more. Mr. Durst has toured across North America and in Europe. As a kid growing up in Wingham and then London, ON, Bill was heavily influenced by Motown, R&B, Toronto Psychedelic Soul music as well as the British Blues Invasion and Jimi Hendrix. Bill’s entrance on the national/international stage was with his classic rock band Thundermug formed from London R&B groups in 1969. By the summer of 1972 the band had a number one hit and a fan following in Eastern Canada. The band went on to record a total of 5 albums, (3 albums in the early/mid 1970s and two CDs in the mid 1990s) releasing records in the US and Europe. 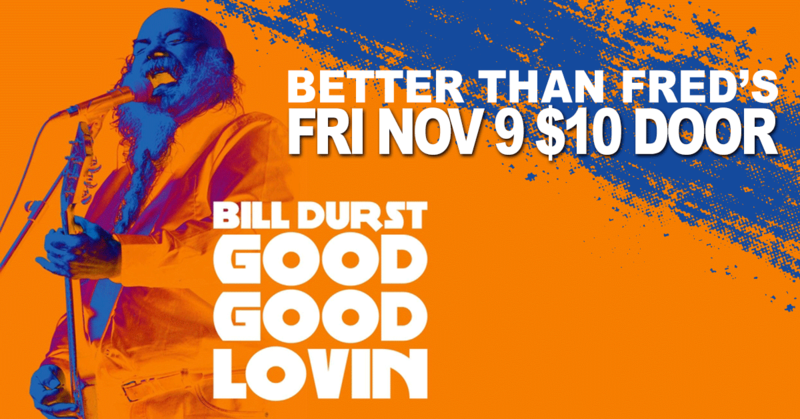 Bill put out his first two solo releases in the mid 80's but it wasn’t until the early 2000's that Durst got some real career momentum. In 2004 he proclaimed his intention to start up a “little, fuzzy, psychedelic blues band” and since then Bill and his co-writer Joe DeAngelis have produced 5 full length CDs: The Wharncliffe Sessions (’05), The Great Willy Mammoth (’09), Bill Durst Live (‘12) and Hard And Heavy (’13) Good Good Lovin ('15).